Just to recap for those who have jumped straight into this page.... Edilio Parodi s.n.c. are an Italian toy company. 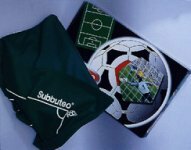 They were responsible for importing Subbuteo into Italy for many years, and are credited with creating the fanatical support the game receives in Italy. 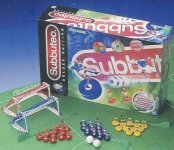 In 1997, when Hasbro ceased to provide new Subbuteo products to Italy, Parodi produced their own version of the game called Zëugo. Meanwhile, Hasbro announced that they were ceasing production of Subbuteo in 1999, but an outcry caused a change of heart. This resulted in a small new range which was launched in an exclusive deal with Toys-R-Us solely in the UK. This small range was not really publicised and slowly died a death. By 2002 there were very few items left in the shops. However, this decline in production had not been mirrored in the interest in the game at ground level. After struggling in the 1990s, the corner seems to have turned. This rising interest allowed Parodi to sell the old Subbuteo items that had probably been clogging up his warehouse for twenty years (oddly it seems nobody in Italy had wanted to buy obscure English rugby teams like Plymouth Albion). This boost in sales obviously gave Parodi the insight that Hasbro somehow seemed to lack. That Subbuteo items will sell once more. All this lead to the Parodi company gaining a licence from Hasbro to start producing brand new Subbuteo items. 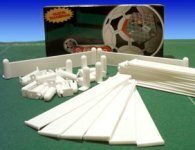 A new range was launched in 2002, essentially for the Italian market, but with Subbuteo's established internet community, it was always going to have more widespread appeal. Part of the deal seemed to be that Parodi dispose of all the spare Hasbro stuff first (or perhaps it was just cheaper to do it that way). Either way, this mix of old and new lead to the sort of chaotic range that my fellow Subbuteo historians will be very used to. However, as time has past, so less of the range is "old stock" and more of it is new items. The Parodi range of 2002 - "Using up the old Hasbro stock"
This new era in Subbuteo production had a low key launch with the arrival in Italy of a 2002 catalogue. This consisted of accessories and teams which were mostly from the 1996 range, which was the last big range sold outside the UK. The 2002 catalogue showed 86 teams, and whilst most were shown using the 1996 illustrations, some of the teams were actually of later designs. For instance the England away kit (ref 720) is shown as the red version, but Parodi were selling the later grey outfit. These anomalies can be explained by the fact that catalogues were not produced after 1996, so no illustrations exist for the later teams such as this grey England (teams 12, 13 and 14 seem to be the only teams in the Hasbro re-numbered range that ever had illustrations). The 2002 Parodi Hand-Painted teams. These teams started to appear in the summer of 2002, and were mainly hand-painted versions of existing 1996 kits as shown in the 2002 catalogue. Parodi had inherited this team range from Hasbro, and obviously there would have been differing levels of stock for each team. The hand painted versions seem to be a way of fulfilling demand for teams whose stock had been exhausted. If there is demand for a team in the catalogue, but the company have sold out, why not just paint some more? The finish on these teams used the thick paint associated with Zëugo, but here it makes me wonder whether the teams were actually painted over other old sides that were found to be over stocked, or not selling well. Perhaps a way to be rid of lots of standard red and blue teams from old box sets? The teams are now illustrated on the Parodi team colours Introduction page. A fix-up set assembled in Italy using the large deluxe set box from the final Hasbro range (did they make too many boxes? Did it sell that badly?). The contents are different than the English version - utilising the old World Cup goals, three boxed teams from the Parodi range, and the new pitch (see below). I don't think it has the grandstand sadly, which cuts down on the value of the set. This 2002 catalogue seemed to be a stop gap. A chance to sell off old warehouse stock, and to get people used to seeing Subbuteo in the shops again before the arrival of the new range. The "proper" new range arrived in 2003. The New Italian Range 2003 - onwards. This was the new standard set, and was to be the foundation of the new range. Although it is basically a club edition, featuring two teams, pitch goals and balls rules etc, all the components are different to the standard Hasbro releases. The set features a new style of pitch, and the first sighting of Parodi's new two-piece bases, which are designed for the modern style game. The details of this set can be found on a special "Focus On" page. The 2003 range saw a massive range of 115 new hand-painted teams being produced, as well as an unpainted side for the figure painters among us. Sadly, about two-thirds of this matched the 2002 sides, with thickly painted teams on Hasbro bases in Hasbro boxes. However, some teams were all new, with a different player type, base and box. June 2004: As the original teams sell out, more of them are being replaced with the new players and bases, in the new Parodi black team box as illustrated above. Introduction and 2002, 2003 Part 1 AEK- Parma, 2003 Part 2 Perugia - West Ham and specials, 2004-05 League Teams and late-comers. One of the main complaints about Hasbro's Subbuteo reign is the quality of the pitches, especially once they ceased to produce the Astropitch. Parodi are now producing their own Astropitch (but I only have a picture of the tube!!). While the Astropitch looks like being the deluxe choice for serious players once again, it is pretty expensive. Luckily, Parodi's cloth pitch is a fine budget option. With a velvet-like surface, and a reluctance to crease, this fold up pitch is a delight to play on. Two sets of goals have been produced by Parodi. 61130: As the number suggests, this is the Parodi version of the classic Subbuteo World Cup goal. As with the original SSG version, the goal has square posts, and is moulded from a single piece of plastic. The Parodi version is thicker and therefore tougher, and the nets are plain white. Maybe it was just me, but I couldn't get my nets to fit very well. 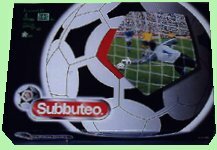 This goal was also used in the Parodi box set. 61168: A completely new style of goal with rounded posts and a back bar to prevent naughty goalkeeper encroachment. These goals have a separate green base, and are robust and practical. The choice of 61168 as a ref number is a little odd, as it means that the set doubles up on the old unpainted spectators number. 61205: This set adopts the old white Tango balls number in the range. However, the new balls are a selection in red, white and yellow (the number of balls in each colour can vary). The yellow doesn't glow like the old Waddingtons one, but the balls look quite nice. I have heard that the quality control is not as good on these balls as with the old Tangos - which might be an issue if you play at a high level. 61209: Adopting the number of the orange Tango balls, this alternative ball pack features the same colour balls as the Tangos, but with the star logos of the Champions League. This is the first time this pattern has been produced in Subbuteo. The goals and balls are the two basic items that you might need to replace breakages, and are sensible items on which to base an accessory range. At first glance, a set of fifty painted spectators seems a more surprising start to the range. However, the fact that this spectator pack features so early in the range indicates that Parodi are catering for both the playing and collecting markets. Spectators have become sought after items for collectors, simply because so many are needed to fill a stadium, and SSG only ever sold painted figures in packs of ten. To me, this was a good sign that Parodi has a good feel for the Subbuteo market as it currently stands. This isn't a cheap pack (it's usually upward of 25 Euros or £16), but then painting 50 of these little blighters is a time consuming process. A fence surround is pretty much an essential Subbuteo item, unless you enjoy fishing the ball out from behind bookcases, or from out of the cat. The classic green surround did the job very well, but its picket fence look does come from the era when everybody in the crowd wore a hat. The other problem with the green fence is that every collector has a great mountain of the stuff. There can't be any extra sales in that area. So here is Parodi's 21st Century take on a pitch surround, with plain white boards and posts. An advantage to having plain boards is that you can put advertising on all of them if you want to. Subbuteoworld have started making their own stickers for new fold up adverting boards (like the old C169), and will include a set of these stickers if you buy the fence from them. That's currently all there is to the Parodi accessory range. It was announced in December 2003 that the Parodi licence would not be renewed for 2004, but in the end it was. So we may see some new accessories in 2004.